Updated May 25 at 10:18 a.m. Eastern. 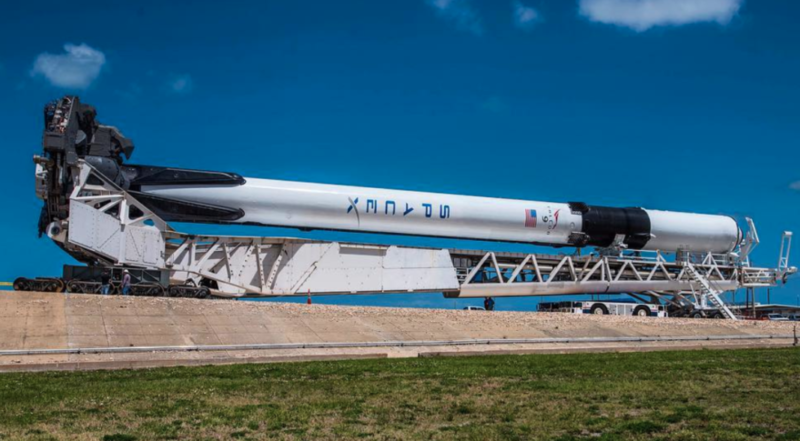 A last-minute glitch May 10 postponed the Block 5 Falcon 9’s debut launch 24 hours to May 11. SpaceX blamed “a standard ground system auto abort” for halting the countdown 58 seconds before liftoff. The rocket lifted off successfully May 11 at 4:14 p.m., landed its first stage 11 minutes later and deployed Bangladesh’s first telecom satellite, Bangabandhu-1, to geostationary transfer orbit just under 34 minutes later. Musk said SpaceX put great effort into creating extremely reliable COPVs, or composite overwrapped pressure vessels, used to store helium to pressurize the propellant tanks in the launcher’s second stage. SpaceX has completed the new pressure vessels, but has yet to include them on the Block 5. The launch company plans to include the new pressure vessels no later than an August demonstration mission of an uncrewed Dragon V2 capsule. “Starting with our first Block 5 launch, and working closely with NASA, SpaceX will evaluate the components, systems and operations from each Falcon 9 Block 5 mission to document the vehicle’s flight heritage and assure our development of the most advanced, reliable and safest human spaceflight system ever built,” the spokesperson said. In September 2016, a Falcon 9 exploded during preparations for a static fire test and destroyed a telecom satellite for Israeli fleet operator Spacecom. SpaceX traced the cause to liquid oxygen in the upper stage tank that got trapped between the COPV overwrap and liner and ignited either from friction or other mechanisms. SpaceX has since worked to redesign those pressure vessels in cooperation with NASA in order to address the agency’s concerns about using that design on later Falcon 9 commercial crew launches. Musk said the improved COPVs have a burst pressure “more than twice what they are actually loaded to on the pad.” SpaceX has a contingency design that would involve switching from high-strength carbon fiber with an aluminum liner to the superalloy Inconel, but that is “unlikely to be necessary,” Musk said. While block numbering would suggest this is the fifth iteration of the Falcon 9, Musk said the Block 5 “is arguably Falcon 9’s version 6” based on how improvements have been made over time. “The word ‘block’ is a bit strange. We kind of adopted it from the Russians,” he said. Musk said the each of the nine Merlin engines used to power the Falcon 9’s first stage now have an 8 percent increase in thrust at sea level to 190,000 pounds-force. The single vacuum-optimized Merlin engine on Falcon 9’s second stage has a 5 percent thrust increase to 220,000 pounds-force, he said. In addition to greater reusability, SpaceX’s Block 5 Falcon 9 is designed to meet NASA commercial crew requirements and Air Force national security launch criteria. It’s also designed for easier manufacturing. Musk said the Falcon 9’s octaweb structure, used to support all nine first stage engines and provide compartmentalization in case one or more fails, is now much stronger. The octaweb is made with bolted instead of welded aluminum and has greater thermal protection to prevent melting, he said. SpaceX put latch mechanisms on the Falcon 9’s landing legs so the vehicle doesn’t have to rely on external clamps for steadying on ocean-platform landings, Musk said. Musk said the rocket’s interstage features a hydrophobic thermal protection developed by SpaceX that is highly reusable and doesn’t require paint. Placed between the first and second stages of the rocket, which are painted white, the jet-black carbon fiber interstage harkens back to SpaceX’s first rocket, the Falcon 1. “Obviously, aesthetics are a minor factor in rocket design, but I still like the fact that we’ve returned for nostalgic reasons to having a black interstage,” Musk said.